Divide broccoli in small florets and blanch in salted water. Dice onions and mix with sunflower seeds, mayonnaise, yogurt, balsamic vinegar, salt, pepper and sugar. 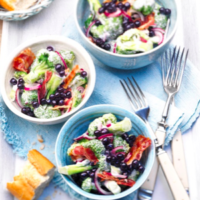 Add broccoli and wild blueberries to the dressing. Marinate for at least 2 hours. Just before serving, fry bacon until crisp. Roughly chop and sprinkle bacon over the salad.